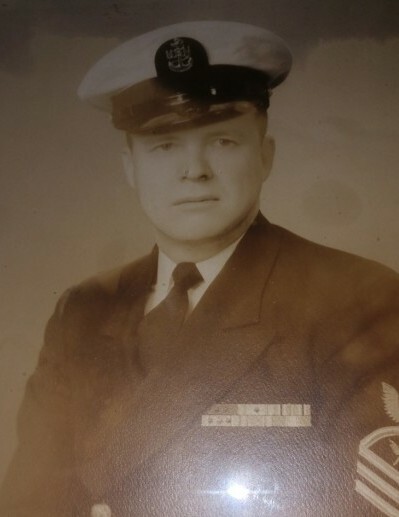 Billie Horton, CPO USN (Ret), 97, formerly of Summerville, SC, widower of Hattie Horton, died Tuesday, March 19, 2019 in Greeneville, TN. Graveside funeral services will be held Monday afternoon, March 25, 2019 at Summerville Cemetery at 1 pm. Visitation will be at Parks Funeral Home Monday from 10:30 am - 12:30 pm. In lieu of flowers, memorials may be made to any military organization. Bill was born December 23, 1921 in Lawton, Oklahoma and spent his youth and school years in Mexia, TX. He enlisted in the US Navy on 5 Jan 1940 and he retired Oct 1959. Bill served in Destroyer MacDonald DD351, Cruiser USS Northampton CA26, Carriers Shangri-La CVA38, Bon Homme Richard CV31, Kearsarge CV33, Hancock CV19, Midway CVB41 and various shore duty stations including Joint American Military Mission for aid to Turkey, Ankara. Bill often reminisced about the joy and pride of working in the Pentagon for Admiral Arleigh "31 Knot" Burke who was Chief of Naval Operations and Chairman, Joint Chiefs of Staff. A Certificate of Appreciation from President Harry Truman in March 1950 highlighted Bill's devotion and loyalty to his Navy and Country. On May 15, 1995 the Secretary of the Navy recognized Bill's ship participation in "Navy Task Force 16"-the April 18, 1942 LtCol Doolittle Bombing Raid on Tokyo. All Bill's love and respect for his darling wife Hattie and his honor and esteem for family and friends remain with him this day and forever when they get together for always. Bill will be reunited with his darling wife Hattie and leaves behind his children, Cheryl Horton, Carol Whitehurst, Rebecca Smith and Clifton Horton, his niece, Jeanie Ann Huffman; brother-in-law, Bert E. Ramsey, Sr.; and his longtime friends Al and Magda Funtanilla.